That's the standard packaging size. Recently, I was surprised to find that you could even purchase eggs by 4 in Paris. One explanation is that agro-business found yet another way to sell something more expensive a lot of people in Paris and the suburb actually live by themselves. The other plausible reason is that French have smaller fridges are more worried about their cholesterol level now than 5-10 years ago and hence have been shunning eggs from their diet, hence needing fewer; they might also be worried about freshness and would rather purchase eggs more often. Who knows? France being France, the government has come up with a very strict labeling system to inform consumers and ensure securité alimentaire (food safety). Each egg sold retail (ie, not direct from the farm), has to be stamped with a string of numbers that tell you how les poules (hens)) have been raised (organic, free-range outside, free-range inside, or cage), FR (if the egg was produced in France) and the identification of the producer (for tracking purposes). The box comes with additional information (size, packaging center, date). As a result, should there be any salmonella suspicion, producer, distributors and government agencies would be able to track down the eggs and inform the public. French eat a lot of eggs : whites, yolks, omelets, sunny-side up, poached, soft-boiled, hard-boiled, or even raw: eggs are eaten in every forms and make up a large base of our traditional dishes such as soufflé, quiche, mousses and cakes. However, unless you are in a restaurant/hotel and are served a petit-déjeuner anglais (English breakfast), we don't eat eggs for breakfast. We tend to stick with bread, butter and jam. That's the major difference with the U.S. where eggs are mostly eaten for breakfast. Breakfast and brunch menus always include egg-based dishes. It's actually a real cultural challenge to learn how to order eggs for breakfast! I'm still learning it! That said, in my family, before the whole cholesterol-alarm, we had a phase where my dad would make us oeuf au plat (sunny side up) for breakfast. Since we were young, we wanted him to break it for us so as not to poke the yolk with the shell! We all had our little individual baking dish for our morning oeuf au plat. I think that, back then, my parents were more worried about us going to school with no or a very light breakfast than about cholesterol! Some day, we grew out of it (or were more pressed by time to get to school)...but I have fond memories of having my oeuf au plat! Some Sunday evening, we would also have un oeuf cocotte (surprise egg) where an egg is softboiled au bain-marie together with mushrooms and cheese. Yet, the best memories of eating eggs is at my grand-mother's country house. As soon as we arrived, we would start the fire to get the stove going (yeah, wooden stove!!) and then headed to the nearby farm to get raw milk and eggs. The eggs were obviously just out of the poulailler (hen barn) and it was therefore crazy safe to eat them softboiled. My grand-mother loved eggs and eating her oeuf à la coque with mouillettes (bread sticks spread with butter) was one of her petits plaisirs of being back in her home village. I introduced eggs to my children after their first birthday for allergic reason. I also tried to avoid giving them undercooked eggs but never went all the way to purchase pasteurized eggs to cook. Nowadays, if they are cooking with me in the kitchen, they will mostly likely be licking the dough made with raw eggs (that's so much fun!)... Does it worry me? No (mostly because my children are healthy)! Also if we were to ban raw eggs from our diet, nobody would be eating chocolate mousse or Eggs Benedict!!! Today, when I purchase fresh eggs, we sometimes have un oeuf à la coque which we eat dipping mouillettes. My children love it because they think it's a fun way to eat an egg! I cook oeuf au plat when we eat savory crêpes (galettes de sarasin); and we only eat omelette when I am away and my husband has no idea of what to cook despite a full fridge. Since I don't like omelette much, especially if they are overcooked, I never cook them myself. I'd rather eat an oeuf à la coque than an omelette. Besides, the idea of eating 2 or 3 eggs in one serving of omelette does not do it for me. So, mostly, we eat "hidden eggs" in all the dishes and cakes I make at home. When I don't know what to cook and if we have not eaten too many eggs in the last few days, I make a Quiche Lorraine. Quiche Lorraine is a favorite in my family, so I know that serving it will make everyone happy! Quiche Lorraine is a savory open pie which filling is made of eggs, milk/cream and lardons (a small strip or cube of pork fat). Most people add cheese for extra flavor but the traditional recipe does not call for cheese (now you know!) Quiche Lorraine is the most traditional quiche served in France; however, a lot of people have started to make different types of quiches (spinach, vegetables, meat). 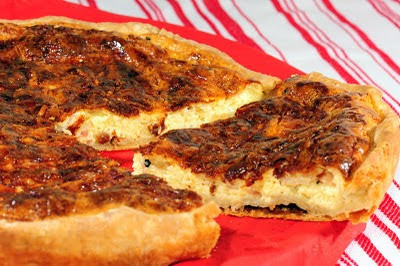 We call them "quiches" if the filling includes the same egg-cream filling (eg: quiche aux épinards, quiche au saumon). Some people serve it as an appetizer but I only serve it as an entrée for healthy reason because, let's be honest, it's not your most-healthy recipe! However, it's delicious and so easy to serve along with a green salad or other crudites for the children. Try it! Bon Appétit! In a skillet, cook the bacon pieces over medium heat. When cooked, take them out. Lay the dough on the tart dish, flipping the extra dough back along the edges of the pie dish (to make a thicker crust). Pick the crust with a fork to avoid air bubbles to form. Lay the bacon in the dish. Pour in the batter over the bacon. Cook in the oven for 40 minutes. If you want a lighter filling, you can use 1/2 cup (125ml) of milk and 1/2 cup (125 ml) of heavy cream. You don't want to undercook the Quiche to ensure that the crust is cooked. I find that the crust tastes better if I let it rest for longer; I generally make the dough in the morning (it takes 10 minutes) and cover it with plastic wrap and use it in the evening. ah quiche lorraine is so great in cold weather. I absolutely love the concept of your blog! I'll be back. Ah Gaëlle... encore un plat que l'on ne peut plus manger!!! (sacré régime!!!!) pourtant Côme adore la quiche lorraine! Ici à Strasbourg, on mange la tarte flambée... il n'y a pas d'oeuf mais c'est quand même gras (crème, lard, oignon!) sur une pâte à pain très fine! Côme adore aussi! Moi aussi, j'avoue mais c'est pareil en ce moment c'est interdit!!! Bon pour ajouter au débat il me semble que dans la quiche traditionnelle il n'y a pas de gruyère mais bon... c'est une affaire de goût! et pour ma part je rajoute un peu de muscade! Désolée, la prochaine fois j'essaie d'écrire en anglais. Just a thought for you: I prebake the tart shell until it begins to be golden so it'll be very crisp. A soft crust is my biggest kitchen pet peeve!